1. Begin by caramelizing your onions. Heat a large non-stick frying pan over high heat, adding the onion and sauté, stirring all the while, over a high heat for about a minute. Sprinkle with salt. Reduce the heat to low and continue cooking the onions for another 45 minutes, stirring them occasionally. You want them dark and caramelized. 2. Meanwhile, heat the oil in a large pot over medium heat. Add the onion and cook, stirring, until softened, 5-7 minutes. Stir in the ginger, garlic, cinnamon stick, cumin, allspice, and bay leaves, and cook until the mixture is fragrant, about 1 minute. Stir in the stock, the rice, and the salt. Bring to a boil over high heat, then immediately reduce the flame to medium-low and let the rice simmer for 10 minutes. Stir in the red lentils and cook until the rice is tender and the lentils are meltingly soft, about 30 minutes. Add more water if you feel it is too thick (Melissa suggests another 3 cups of water but I never add that). 3. 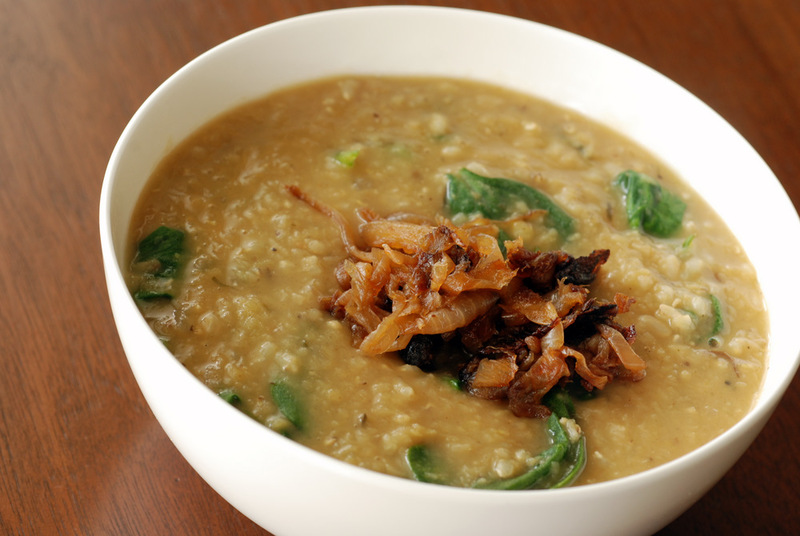 Once the lentils are soft and the rice cooked through, stir in the spinach, cover and let it wilt completely. Taste, and add more salt if necessary. If desired, squeeze in fresh lime juice. 4. 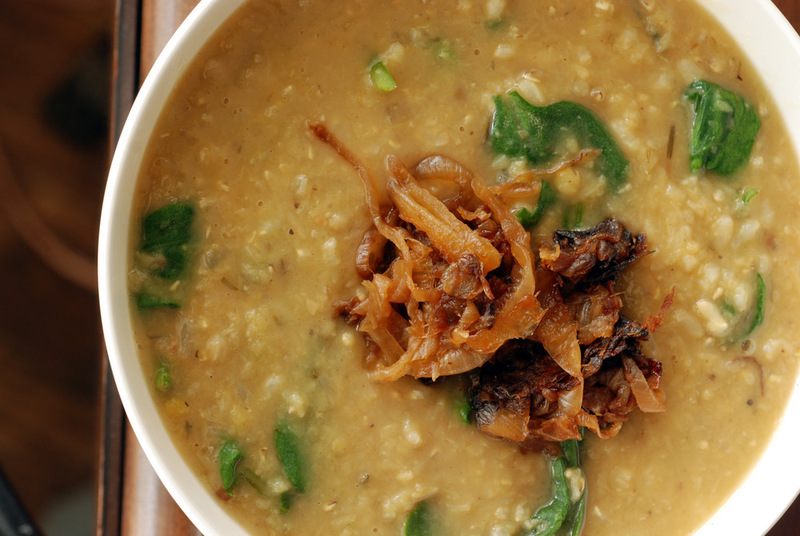 To serve, ladle the soup into serving bowls and top with a small handful of crispy onions. Your title “Dal Bhat meets Mujaddara) says it all. What a great recipe! Hey Eileen, It is so true. I remember going to Morocco and dusting off my French and my brain had to dig pretty deep to remember words. Recognizing them afterwards was not as bad. I had a feeling you were on vacation and I’m so glad to hear you were having an amazing time! It’s so hard to find even vegetarian foods somewhere like Colombia but I’m glad to hear that you made it work. I went away for four days and I am so glad to be back to eating normal foods…like this! Sounds superbly delicious! In LOVE. Anything with caramelized onions…and the spices….I have a feeling this could be a favorite. Oh I know that feeling. Holidays are wonderful, but there is something very reassuring about returning home and being able to communicate in complete sentences and to know that everybody understands you perfectly without any fear of amibguity. Love the sound of this dish – that cookbook is on my wishlist. Thanks so much for sharing this at Cookbook Sundays.